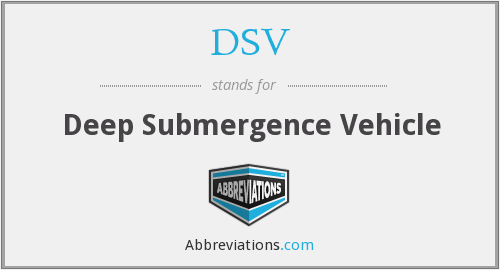 What does DSV stand for? What does DSV mean? This page is about the various possible meanings of the acronym, abbreviation, shorthand or slang term: DSV. DSV A/S, simply known as DSV, is a Danish transport company offering road, air, sea and logistical transport services throughout the world. Since its foundation in 1976 by 10 independent Danish haulers, the company has achieved rapid expansion and international presence, predominantly through a series of strategic competitor acquisitions, the most important being Samson Transport, DFDS Dan Transport, Bachmann, Frans Maas and ABX Logistics. With headquarters in Copenhagen, Denmark, and offices in more than 60 countries, DSV employs approximately 21,000 people and collaborating with partners and agents worldwide. DSV is listed on NASDAQ OMX Copenhagen and included in the OMXC20 index as one of the 20 most traded stocks. The company is structured in three divisions, DSV Road, DSV Air & Sea and DSV Solutions. Its biggest activity lies within the European road transport network, followed by its air and sea freight forwarding business. The group also has a growing pan-European contract logistics business. As part of an asset-light financial strategy to maintain fixed costs at a minimum and be able to quickly respond to market fluctuations, DSV does not own any ships or aeroplanes and only a small number of trucks and trailers. Couldn't find the full form or full meaning of DSV? Know what is DSV? Got another good explanation for DSV? Don't keep it to yourself! "DSV." Abbreviations.com. STANDS4 LLC, 2019. Web. 22 Apr. 2019. <https://www.abbreviations.com/DSV>.